Fully flexible, Tekna® trees are synthetic, which assures the same tree shape in each saddle, unlike traditional hand-made trees. The QUIK-CHANGE™ Gullet System allows the rider to easily modify tree width from narrow to extra wide using the gullet plates, sold separately. Hassle free, easy maintenance. The QUIK-CLEAN material was designed for the discerning equestrian who would rather spend more time riding and less time cleaning tack. Now you and your horse can ride in the rain, play in puddles, even take a swim – no amount of water will hurt the tough QUIK-CLEAN exterior of a Tekna™ saddle or bridle. All Tekna™ saddles carry a five year structural warranty. 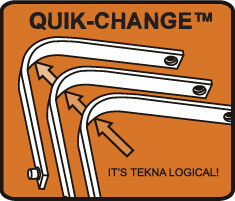 Congratulations on your Tekna®-logical purchase! 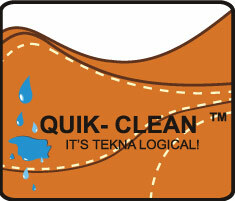 Wipe your Tekna® tack with a clean, damp cloth and let dry. For sueded seats and knee pads, if the nap of the material rubs smooth, you may gently use a stiff brush to raise the nap. No detergents or solvents should ever be used. Do not dry in direct sunlight or use heat.